The seats we had secured on the Anhanza bus were right at the back next to the toilet… not ideal. However, we had no idea what we were in for. After about 1 hour the bus started to climb into the Andes. I’m sure it was a combination of many factors: the unpaved road, the ever-increasing altitude, the swaying of the bus back and forth as it climbed through the mountains, but after about two hours I spent the remaining six purging the contents of my stomach. I was not alone. The locals joined in too. A smorgasbord of vomit. According to Ryan, it was one of the most picturesque bus rides in the world. I shall have to take his word for it. We arrived in Ayacucho under cover of darkness and rain. Lots of rain. We hadn’t booked our hostel ahead of time, but had three good options up our sleeves. We took a taxi (no mean feat in Ayacucho in the pouring rain) to the Hostal La Florida, Jr. Cusco 310 (50PEN/CAD$17.90 per night double room with private bathroom). Hostal La Florida has a very beautiful courtyard garden and clean, small rooms. The wifi was a little touch and go. Our room was on the top floor and we had great views of the rooftops and surrounding mountains. As beautiful as Ayacucho is, the next morning I couldn’t drag myself out of bed due to altitude sickness. Or as they call it in these parts: soroche. Caused by the low pressure of oxygen at high altitudes, it commonly occurs above 2400 metres. 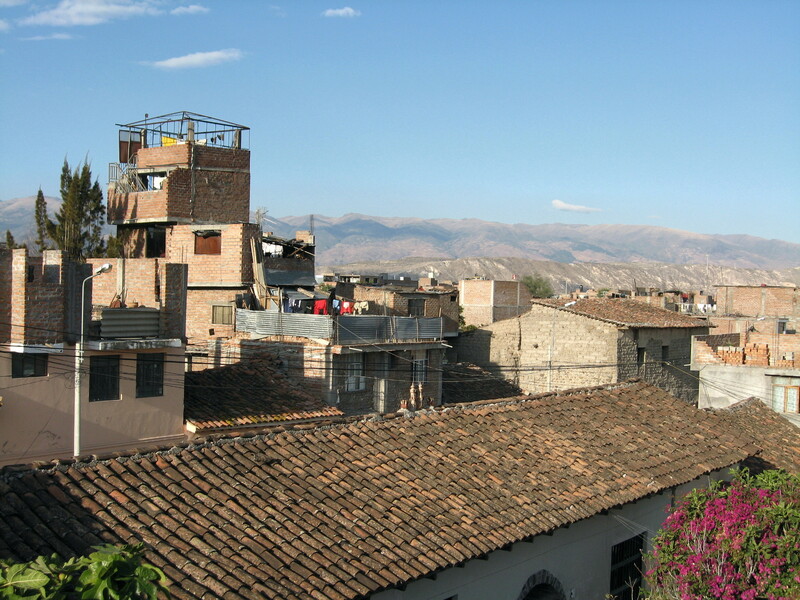 Ayacucho sits at 2761 metres. It affects many people differently. Ryan suffered from a slight shortness of breath, but I needed a days rest to get over what felt like the worst hangover of my life. 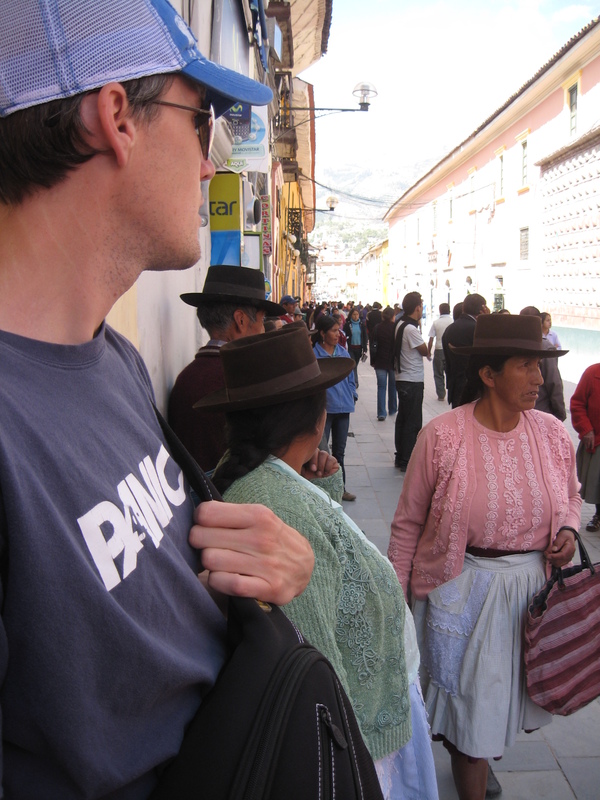 In search of a cure for the soroche, we tried chewing coca leaves (video to come!). They didn’t seem to have much of an effect on me other than smelling pretty bad. 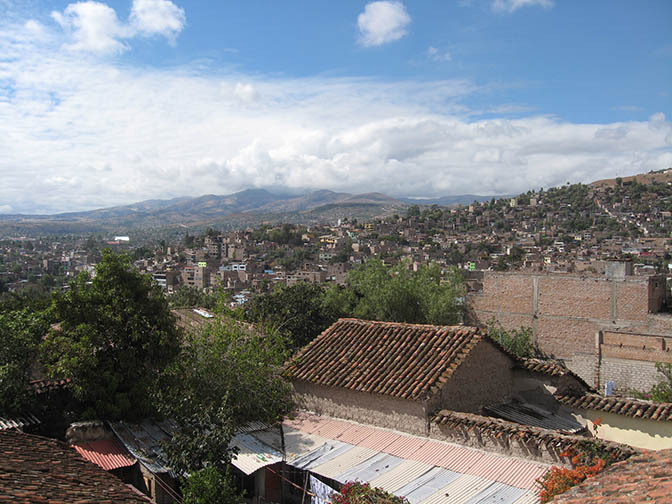 Ayacucho is an extremely walkable city. The hostal was a block from the main square where the tourist information office is located. They gave us information on buses to our next destination and maps of the town. 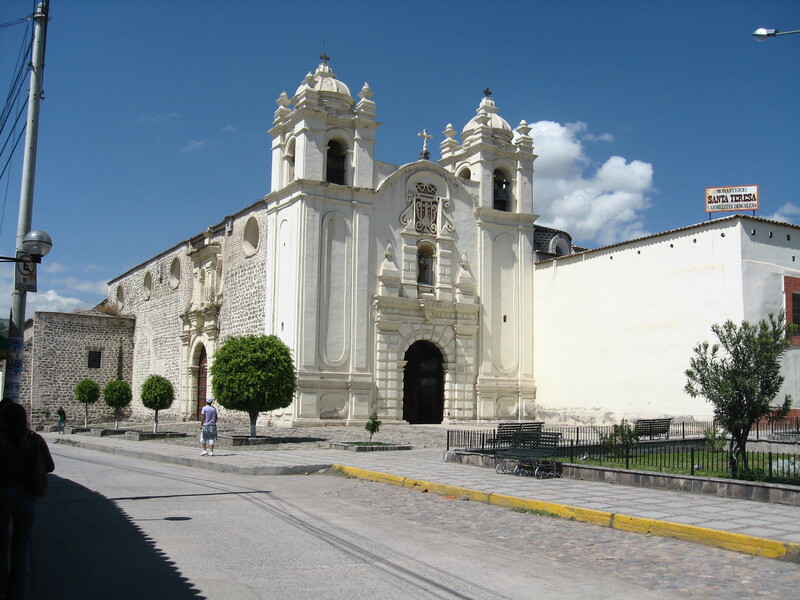 The city is famous for its beautiful Colonial churches (of which there are a whopping 33 – one for each year of Jesus’ life!). We made sure to take a walk around the many markets in the city although they are not for the weak of stomach. They sell meat – mainly chickens and guinea pigs (cuy), but there is no refrigeration so chickens hang from the stalls and live guinea pigs are kept in cages and slaughtered and prepared for the customer upon request. A young boy would weigh people for change. He was keeping a log of people he had weighed. Ayacucho’s streets are filled with people and life. It seemed like everywhere we turned something interesting was going on. Local men look for work at the employment centre. We took a walk to the Artisan market in Ayacucho which was a great place to buy some lower priced tourist trinkets. Our next stop is Abancay. The tourist information office told us that the bus ride is about 14-17 hours so we opted to take a bus to Andahuaylas (10 hours) and stay overnight before continuing on our journey to Abancay. We decided to take Expreso Los Chankas (25PEN/CAD$9) to Andahuaylas. Our other option was Celtur. We stood outside the offices and watched the buses come and go and decided that the Los Chankas’ buses seemed like they were in better condition. Both services are basic, but buying our ticket a day in advance allowed us to choose the front seats. Total for Ayacucho (3 nights including food, laundry, bus tickets, hostel, etc. ): 147PEN/CAD$52. This means we are currently 77PEN/CAD$27 and 2 nights over budget! To get a better sense of our adventure in Ayacucho, watch the Ayacucho video in our backpacking South America series of videos.